(From Nikon lens literature) A high performance compact and lightweight 7.5x zoom lens for Nikon DX format digital SLRs. 18-135mm focal range (7.5x zoom) for use in a wide variety of situations (equivalent to a 27-202.5mm lens in the 35mm format). ED glass and hybrid aspherical lens elements minimize chromatic aberration, astigmatism and other forms of distortion, while ensuring high resolution and contrast. Incorporates a compact SWM (Silent Wave Motor) for quiet focusing. Delivers high-level optical performance that is specially designed for use with Nikon DX format digital SLRs. Employs a seven-blade rounded diaphragm opening that achieves a natural blur for out-of-focus elements. Two focus modes, [A] and [M], are available. In addition, while the lens' A-M mode switch is set to A, the user can adjust focus manually, after focus is achieved by AF-S operation. Enables focusing from as close as 45cm (17.7 in.) from the subject through its entire focal range. Internal Focusing (IF) design contributes to compactness and eliminates front element rotation, enabling the use of circular polarizing filters. Flower-shaped Lens Hood HB-32 (provided) greatly reduces image degradation from stray light. 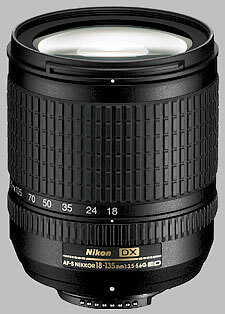 This is the kit lens that Nikon introduced with the D80 in mid-2006. It represented a new level of optical capability and quality for a kit lens, and as such greatly boosted the value of the D80's kit packages. Lens designers always face difficult choices in deciding how to optimize a given lens design. There's no free lunch, in that you can't simultaneously optimize all aspects of a lens' performance, without pricing it clear out of the market, making it too unwieldy to carry, or both. From playing around with it, we knew that the 18-135 was a sharp lens, but we were nonetheless astonished when we looked at the first blur plots, after having run it through its paces in the test lab. Shooting wide open, it was just uncommonly sharp for a mid-priced zoom lens, and stopping down just a little gave very uniform sharpness across the frame. - At least from 18-105mm; it does get a little softer at 135mm. Probing deeper though, it became evident that the 18-135's sharpness came at some cost in other areas, particularly geometric distortion and light falloff in the corners, commonly (if somewhat incorrectly) referred to as vignetting. Geometric distortion swings very rapidly from significant (1.17%) barrel distortion at 18mm to pretty pronounced (0.67%) pincushion distortion at 24mm. Pincushion increases to a high of 0.97% at 35mm, and then decreases gradually, reaching 0.66% at 135mm. Shading is also pretty high when shooting wide open, ranging from 1.22 EV at 18mm to a minimum of 0.53 EV at 70mm, and then rising again to 0.73 EV at 135mm. As high as those numbers are, they improve only slowly when you stop down, and never fall much below 1/3 EV at 18mm. (The good news though, is that shading is fairly easy to compensate for using the Lens Correction filter in Adobe Photoshop, and so many copies of the D80 will be sold with this lens that it's almost certain that DxO will support it in their excellent Optics Pro lens-correction software package. Chromatic aberration varies in a complex fashion as you zoom the lens. At wide angle, both maximum and average CA is fairly high, meaning that the CA extends fairly far into the image area (something confirmed in our real-world shooting with it). In middle focal lengths, maximum CA is even higher, but the average is quite low, meaning that the high CA is confined to the extreme edges and corners of the focal plane. Overall CA is lowest at about 105mm, but increases to higher values at 135mm, particularly when the lens is stopped down. Build quality of the lens is excellent, perhaps not quite up to the level of the very best Nikkor optics, but far superior to the plasticky cheapness typical of kit lenses. Our test sample also showed little or no zoom creep, it maintained its zoom setting quite well, regardless of orientation. The internal focusing (IF) is also nice, in that the front element doesn't rotate while focusing, making this lens well-suited for use with polarizers or graduated neutral-density filters. While not a macro lens by any stretch, the 18-135 also focuses more closely than do many long-ratio zoom lenses, handy for those times you'd like to shoot a little closer to the subject, without reaching for your macro. Very sharp, great zoom range, fast and silent. I received my 18/135 bundled with my camera. Very sharp, great zoom range, minimal distortion, fast and silent. Really nice travel lens. Its shortcomings are: plastic bayonet without stabilization and unfortunately even minor distortions are observed throughout the zoom range. This must be the most underrated lens. It's very sharp and has nothing come close to it. I had: 18-55 II, 16-85 VR, 18-105 VR, 18-70, 50 from Nikon. 17-85 IS from Canon with a 40D. Sony A350 with 18-70. None of the above can come close to this one. I had one before with the D300 and sold it, not realizing how good it was. Now I have another one on my D90 and it just amazes me. Sharpness can not be corrected in software; all the other things can. If you can buy one: do it now, because this is going to be a classic. Prices are already soring. I was lucky to get one for this price and I can already sell it for 2 X the price I paid. Many people nag about the plastic mount. I read a few stories about people with a fallen camera and the mouint broke off and they replaced it for about $20.- . If this was a metal mount, they probably had to replace the camera mount as well and might even had more damage! So what's the problem with a plastic mount?Metal on metal wears out to and maybe even worse: it will wear out your camera mount as well, while a plastic mount will not. Very very sharp lens at the whole zoom and aperture range, Fast AF. Beautiful tone and colors, Nice allround lens. I got my 18-135 as a D60 kit and, after a year of usage, i can sau it was a bargain. Really sharp all over its (very useful ) range, perfect as a vacation & all-around lens if you - like me - hate wasting time and photo opportunities changing lenses and if you like travelling light. Good control of CA and flare, AF really fast and silent.Trade-offs are vignetting at full wide and full tele and distortion at all focal lenghts, you can correct them in post processing (but it' s a hassle). Lack of IS may be a problem at full tele (200 mm equivalent), consider the 18-105 IS as an alternative, not a big difference 105 vs 135 . Lot's of my shots get published as full-bleed double page spreads. This lens is sharp enough to support that at all apertures and focal lengths. I got my first one as a kit lens with a D80 when they were first released. A friend's dog on a lead became entangled in the tripod and pulled it down onto a concrete floor smashing both lens and camera. The dog was stolen the next day. I wish he'd been stolen the day before. Then, a cleaner at a race team (HRT) got the extension lead from his vacuum cleaner tangled up in the tripod when I wasn't looking and pulled it over onto a a concrete floor smashing both lens and camera. I wish he'd cleaned the day before. I often wonder if he stole the dog. I'm now on my fourth example of this lens, but on the bright side I can be positively cavalier in my attitude to losing lens hoods. I shoot a lot of boats. I was out in a camera boat and had a wave wash over me and the lens. Water was running off it (and me) like a waterfall but there were no ill effects. It was, however, pointed downward at the time. This is an excellent all purpose zoom. I like it as much as I dislike changing lenses, so I use it for almost everything I do, and my work is extremely varied. I'll keep buying this lens for as long as dogs, cleaners, uneven flooring and the elements continue to wage war against me. Fortunately, it's inexpensive enough to keep doing that! I got this as a kit with my D80 and have found it sharp and versatile as a carry around or travel lens. Yes its slow at the long end but that makes it small and light. The perceived build quality is actually fine for the money and target user with a decent zoom action and reasonable quality feel to the plastics. I feel they could have put a metal lens mount on for the money as the lens isn't that cheap when bought alone and lenses such as the F1,8 35mm have one. My first copy died when the silent wave motor packed up but Jessops and Nikon replaced it under warranty. This Didn't convince me of the longevity. I use it less locally now I have fast pro lenses but as a travel lens and walkaround its still a great little lens. Nikon seem to have optimized sharpness, perhaps at the expense of some distortion at the wide end and a bit of vignetting, but its generally miles better than most superzooms and as sharp as many very pricey lenses. This means that the only real compromise is the small max aperture. I purchased this lens in December of 2007 as part of a D300 bundle. Initially, I was torn between this and the 18-200 with VR. After studying the interactive blur-index charts here, I decided to go with this lens and have not regretted the decision. Reading subsequent reviews at this site and others, seems to bear out that the 18-200 is noticeably not as sharp as the 18-135, and softens a bit further at focal lengths above the reach of this lens. The 18-135's range satisfies about 95% of my needs and if I decide to add a longer telephoto, I would want to pair it with the 70-300 VRII, which seems similarly sharp and gives you much more range at a lower price versus the 18-200. I still miss the VR though and had I known that the 16-85 VRII was due out the following spring, I may have waited. Of course, now that the 18-105 VR has been released, there is another compelling option available. Initially I got what I thought were pretty sharp shots at the longer focal lengths handheld but the first time I used a tripod I was amazed at the improvement in clarity. Like any other lens, having a stable platform to work from really reveals what it is capable of. I immediately went out and bought a monopod for general outside use. The sharpness of this lens still continues to impress me. I shoot mainly static subjects outdoors so this lens has been ideal for me. For indoor shots of people, I rely on an SB-600 speedlight. For any given focal length, this lens offers a broad range of aperatures at which you will get very uniform sharpness across the frame. The only exception may be some slight corner softness wide open at 35mm and to a lesser extent at 135mm. Chromatic aberration has not been an issue for me since the D300 automatically processes that out. The one real fault that this lens has is distortion - if there are architectural details in your photos, it is very obvious. I downloaded a trial version of DxO Optics Pro lens-correction software and it did a wonderful job of eliminating the distortion and what shading that I could detect. The only issue that I have with the build quality is some slight instability at the end of the lens - there is a wee bit of a wobble there. I read some early reviews that complained of auto focus problems developing soon after purchase but I haven't experienced anything of that nature. I got my copy about a year and a half after the model was released and it has performed flawlessly over the past year's approximately 2,000 shots. This might be the best current large range zoom for Nikon, price considered. It's significantly sharper than the 18-200VR, at a much lower price. The main optical flaws of this lens are CA and distortion, easily solved in post-processing, as is the vignetting at 135mm. You can't replace sharpness that was never there though, hence the reason I prefer it to the 18-200. The lens is very light, and makes a D80/90 or lower body hardly seem like a burden, and even lightens the load of my D200 quite a bit. Of course, you get there through the cheap plastic construction, but for sharpness on a budget, something had to give. I find the lack of a focus distance indicator annoying, but just another concession to price, I suppose. All-in-all I think this is a very useful lens, as its' flaws are largely forgivable if you don't use OOC JPEG's. For a RAW shooter like myself it is a great carry-around lens at bargain-basement prices on the used market. The lens came with a D80 kit. As a long standing Nikon user, I was initially disappointed with the build quality. However, over time it has proven to be a good performer with a useful range. The main downside for me, as an shaky old wrinkly, is the lack of VR. Had I been aware of the 18-105 I would have preferred to compromise on the shorter range. Good for a kit lens. Mediocre performance in an affordable package. Value for money comes to mind before performance surely. Good coverage for a starter lens. Bought this lens for use on my D60, Great pictures with it, its fast and plenty sharp and the colors are just perfect. The distortion at all focal lenghts is kinda annoying in the viewfinder, and doesnt really hurt a picture if its not a building or landscape. But I have to admit this is the perfect lens for onlt 320 bucks (beachcamera.com) that is so much better than the kit lens and not far behind the 18-200 VR. I have been using this lens for months now, and it has become my primary walk around lens. It has served me well, delivering amazingly sharp images with good contrast through all its working range. The lens has also a nice bokeh in the mid to long range, which is important to me. for me, however. Flare is well controlled by the included lens hood. 18-135 with the 17-55. I would like the faster lens to shoot indoors where flash isn't an option. But now you have me second guessing about what to do. micro seems to be better overall then the 18-135. 135 to the 55 has them raving about the 55.
of a zoom. You are the only person I've come across who has done this. VEry sharp as Dave says , fantastic coverage , amaizng color like my Ls. build quality is not as good as my AF-S12-24, the plastic mount. Well , I bought it with a D40X for travel light , I sold my old D40 because of its primitive AF. But after a few weeks spending time without D40, I missed it so much and I bought a D40X again with this 18-135 .............as Dave says , it is sharp throughout focal range , though as he says , it also vignettes a lot. But I think for my needs,the positive characteristics of the lens, the exceptional sharpness and its weight outweigh the those negative characteristics of this lens such as BQ , vignetting and distorion that are easily corrected in PP. I just wished it had had the metal mount , I am afraid to swap lenses over and over now because of the plastic mount of this lens . But the camera is my travel light kit so I seldom change lenses , and most of time, this lens stays on it. I am thinking of getting another D40X and put the 12 -24 permanently ...............and carry two bodies with 2 lenses to cover all focal range I need. I do this with my Canon sytem : my XTI with the 10-22 , my 40D with my 17-55IS and my another XTI with EF-S60 or 100 macro. I have a XT also and I put my EF70-300DO on it and never ever borther changing it , so no dust or anything getting in my camera body and my lenses are all clean. So I never swap lenses over. I highly recommend getting 2 or 3 bodies, with 3 lenses , for a Nikon , I recommend a D40X with 18-135 or 18-200VR depends on your needs, a D40 with 12-24 AF-S or 70-300VR depends on your needs. For a Canon , I definitely recommend a 40D with the 17-55IS and an XTI with 10-22 set up. If you can get another body with another lens , then get a 60 macro for a Canon , 105VR for a Nikon. I have all of them and I love my 105VR and EF-S60. My AF-S105VR is always on my D80. I bought this lens as my first lens using the D70s. I have to say that this was my first using a DSLR from SLR. So in terms of this review is hard to judge as I am a newbie. Quality of the lens, is acceptable though as I was an old SLR Nikon user, I have seen better construction lens. However this lens seems to meet the expectations and provides very sharp images. I was even told by the seller of this lens that his 18-200VR looses in speed in focusing. I do not know how true was this but I have taken pictures in broad daylight, rainy weather, and long exposures with night photography. Each of them has met my expectation and is indeed a lens if you cant afford the 18-200mm VR, please go for this as second best option. I believe this lens may compliment well with 70-300mm G VR lens as that lens will cover better for the 100-300mm shots better. But again it zooms down to your budget. In terms of an all general purpose and affordable lens zoom, this is the one. Comes with the lens hood that does comes in handy, and is reasonably light on normal camera stands. Well, I received this lens as part of the D80 kit. It's been great so far, but I have noticed that at times, on either my camera or on others' Nikons, the lens is sometimes not recognized by the camera (the aperture setting flashes on the LCD). Perhaps the lens mount is cracked, because it happens in certain positions, like if I try to move the lens around. Other than this problem, the lens is excellent, as one would expect. Build quality is otherwise good, and it feels nicer than the 18-200 Tamron I tried recently. I do wish I had a VR lens (like the Nikkor 18-200), as I shoot a lot of pictures handheld in natural light. But if you don't need VR, this is great, because you probably won't need any other lenses. Sure, I could pick up a prime lens or two, but I am generally satisfied with the sharpness and f-stop range of this lens. I do find some images, especially taken more than 10 feet away, to be soft at times. I wish I had a scale to check my depth of focus, but you can't have it all on a lens priced like this. Aside from that, I do have to wait quite a bit for the auto focus to pick up anything sometimes, in a low-contrast area or in low light. f/3.5 at 18mm seems about average for a lens like this, but handheld exposures at 135mm, f/5.6 (which make up a good portion of my work) get a bit trickier; you're going to want a lot of light, and steady hands. I would recommend this lens over anything else (or, accordingly, the D80 kit over the body-only) to anyone looking for a do-it-all lens that doesn't cost $900 (such as the Nikkor 18-200). It makes a good complement to the D80, D70/D70s, or D200, and it feels right in your hands. It's a bit heavy for the D40, balance-wise, but since the D40 is sold with the 18-55, you might as well just get a second lens, like the 55-200 VR. If you have a body-only camera, on the other hand, and you're on a somewhat reasonable budget for a do-it-all lens, put this one at the top of your list. I do professional work and I actually sold my 17-55DX for this. I was put off, at first, at the plastic mount and lack of a distance scale but the optical quality is amazing. I find it sharper than my 17-55. The f/2.8 wasn't needed on my 17-55 since I take pictures of people at smaller apertures and the extra 80mm reach of this lens makes this all the more appealing. I use this on a D2Hs and it focuses flawlessly in the most difficult conditions, albeit slightly slower than the 17-55. The filter size is 67mm just like my new 70-300VR, which is a plus. Sharpness is out-of-this-world. I've never noticed any CA, but frankly I've not looked for it. Vignetting is supposed to be pretty high, but I like vignetting for my line of work. I don't do architecural work so the distortion I hear about from this lens hasn't been noticeable. Despite the much-publicized shortcomings of this lens, it does everything that I want it to do and it does it pretty well. This is a very light weight sharp lens. I originally posted a review in November 2006, about one month after my purchase. I have now had the lens for about 3 months and am very pleased with it. I recently bought a new Nikon D70s, with the 18-70 kit lens, so I gave my D70 to my wife and put the 18-135 lens on it for her. She especially likes the fact that the lens is very light weight and has a good focal length range. She has now taken several hundred pictures with this lens and the results are excellent - very sharp with good color and contrast. You can't go wrong with this lens as a good walk around lens or for use on vacation. I like the 18-70 lens but this is more versatile with a better range and about equal quality. Outstanding value as a kit lens. The 18-135 zoom range covers all my needs except for nature. I did extensive testing of the sharpness of the lens and it is truly great and if you stay away from wide open and totally stopped down you will be rewarded with very sharp fotos. Barrel and pincushion distortion is easily corrected in post processing, as is vignetting, so I am happy to accept those at the cost of sharpness. Very slight chromatic aberration at 18mm, especially wide open can be detected in my tests, but have not been observed in fotographs. Sharp, lightweight, good range, smooth zoom action. I got this as part of the D80 kit. The lens is well balance with the body. As indicated in the SLRGear review, the lens is very sharp even at the wide open aperature. CA and Vignetting can be spotted at the edge of the photos but they can be easily fixed in software. When using the trial verion of Capture NX, the CA is automatically removed from the NEF images. One thing, the focus ring is very loose. I something changed the focus while zooming. Overall, the image quality is very high and I would recommend this lens. This lens came with my D80 and I could choose from 18-70 and 18-135. I took this because of longer range and I would do it again. I didn't want some excellent superb lens of short range for one certain purpose. I wanted some universal lens for start with my new camera and to learn to handle it. And this lens are perfect for this purpose plus (like bonus) there is good image quality. You can use this on holidays, where you don't want to take whole backpack with you and use it for portraits, nature, animals, etc. I like this lens, it's very good for everyday use at almost every situation. Vignetting can be seen very often, but it can be very easily edited, if needed (or you can let it be, most common users don't care). What I miss is focus distance indicator and for longer focus I miss image stabilization too. What I really appreciate is range and manual focusing. It's great you can manually fine-focus after auto focus. I can recommend this lens for everyday use. I bought it with d80 as kit lens, and I am happy with it. For this value of money it can't be better. I am very new to the world of photography, recently purchasing a Nikon D80 Outfit which included this lens. Considering I am still very new to the DSLR camera world, this lens will be all I need for a little while. It gives me a great zoom range and operates effortlessly. The last thing anyone wants when buying something of this caliber and cost is to feel like you need to immediately purchase additional equipment to really start enjoying it...this lens is a great starter and didn't leave me feeling that way at all. Compared to other DSLR camera kits from the competition, this seems to be the best value and will allow for a lot of photography fun until I have more $$$ to add to my lens collection. Good kit lens. For the price and what you get for it most consumers will be very happy with the results. Watch out for Vignetting at the top and bottom of the range. Low light performance drives you to a tripod fairly fast but that is to be expected. Quality, Build quality is a bit weak wouldn't recommend even the smallest drop. Picture quality is outstanding when used for the right situation based my experience with it and the D80. This lens is extremely sharp across its entire focal range and produces pictures with excellent tone and color qualities. In regards to sharpness, I completely agree with the SLRGear tests and have found this lens to be superior to both the 18-200 and the 17-55. Distortion is significant, though manageable for the type of shooting I do. I have not yet found CA to be a problem. Build quality is nothing less than annoying - I'm not sure what Nikon was thinking. In particular, the tendency for the end of the lens to wobble (extended or not) is inexcusable. This, plus the plastic mount and lack of distance ring, is likely to put off a lot of potential buyers. Nevertheless, given its economical price and truly exceptional image quality, I do highly recommend this lens for general "walk-around" use.